It’s not too late to join us in the HOLY LAND . . .
. . . fill the last few seats on our only open left trip in 2008! 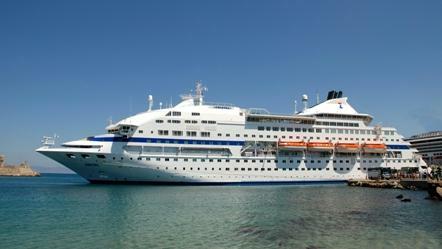 Our St. Paul Cruise through the Mediterranean, Israel & Egypt . . .
. . . is filling FAST! Reserve your cabin now! A University of San Diego decision rescinding a prestigious position to a Catholic feminist theologian has thrust it smack in the middle of a national debate over academic freedom versus adherence to [C]hurch teachings. Faculty and Roman Catholics are divided over USD’s decision to withdraw the appointment of Rosemary Radford Ruether to an endowed chair. At issue is Ruether’s position on the board of directors for Catholics for Choice, an abortion rights organization. Two national women’s religious groups have sponsored a petition with more than 2,000 signatures demanding that she be allowed to assume the post. USD is standing by its decision. Now there’s a petition to get twice as many signatures (4,000) on the Catholic side of the spectrum! Many faithful Catholics want to support a Catholic University that takes a stand to keep its teaching and faculty faithful to the Church.